Bamboo and cork flooring are beginning to be the go to choice for residential flooring options for a number of reasons. If you’re thinking of redoing your flooring at home and love the look of wood floors but don’t like their negative drawbacks, considering bamboo and cork flooring is a great idea. Find out if these options are right for your by weighing the pros and cons first. Eco-Friendly: There’s no question that compared to wood floors, cork and bamboo floors are more eco-friendly. Real wood floors are taken from a number of types of trees like oak, maple, and mahogany. The problem is that more people want wood flooring options than there are trees. But, bamboo and cork provide an alternative beautiful flooring solution which offer the same benefits wood floors do without harming the environment. On one hand, cork is developed from the bark of a cork tree. But, taking this bark is only done once every 10 years and doesn’t do any harm to the tree. One the other hand, bamboo is a special type of fast-growing grass which can be easily grown and harvested over and over. Adaptable to Environment: In some areas, wood flooring isn’t available due to changes in weather annually. Extreme changes with weather like air humidity can cause wood to expand, crack, and warp. But, bamboo and cork flooring seem to be more adaptable to these weather conditions. Clean Up: Carpeting can hold in moisture, making it at risk for stains. Tile floors show dirt faster and may need more frequent mopping. But, both bamboo and cork flooring offer super easy clean up. Just a sweet, dust mop, or mop with simply water will help to clean up any debris or spilt liquid in a flash. Moisture: Cork can hold water so it’s necessary to seal it. With proper sealant, cork floors can be waterproof, making them a great flooring solution for your bathroom or kitchen. But, if you don’t stay up to date on resealing when needed, they could become damaged. Many may not like the fact that resealing cork floors could come into play in the future. Looks: When it comes to cork flooring, you either like it or you don’t. While it may be something you love and wish to invest into because of your specific taste, the next buyer of your home may not think the same way. So, if you are preparing your home for resale, the look of cork flooring may not intrigue all of your potential buyers. 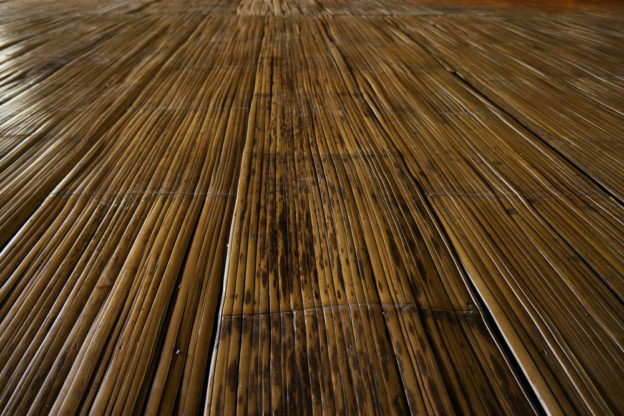 Rating of Quality: Bamboo flooring is a pretty new concept in the home design realm still. So, many manufacturers haven’t done the research needed to conduct a scale of quality for these products. Basically, all you have to go on is price. And, bamboo flooring isn’t cheap ($4-8 per foot). So, you’re best bet to choosing the highest quality bamboo flooring is to pay top dollar. Refinish: Real wood floors provide the option to refinish after a few years of wear and tear. The end result is a cheaper way to renovate flooring. But, bamboo flooring doesn’t provide that option. So, once they’re worn and torn, they need replacing. If you think you’re ready to select the flooring option that’s right for your home, you’ll need to remove your old flooring. If you aren’t a professional or haven’t removed flooring before, it’s best to choose a professional service to do so. That way, subflooring, baseboards, and other preservable flooring aspects can be preserved for future use. By choosing Dustbusters for your floor removal services, you’re guaranteed to have floors removed with our innovative, dust-free technology. This way, you’ll be ready for your bamboo or cork floor installation as soon as we’re done! Get a quote for your floor removal services today by calling us at 866-883-8783.